Tonight at the grocery store, I needed to pick up some prunes to make one of my favorite treats. It turns out you can't buy prunes anymore — instead, the major cooperatives want to sell you "pitted dried plums." Pitted dried plum, of course, is a longwinded way of saying "prune." Why this not-so-subtle shift in marketing? For a long time now prunes have had a connotation, in the US, of being something that senior citizens eat to cure their constipation. This doesn't make a lot of sense. The same connotation hasn't attached itself to raisins, or figs, or granola, or any other number of high-fiber foods. My conclusion is that the reason people think this way about prunes is because they don't understand the right way to eat them. Fortunately for you, I am here to help. The right way to eat prunes is to eat them as pruneaux d'Agen. A literal translation of this is "prunes of Agen," Agen being a region in France. This translation is wrong. Don't be upset if you mistranslated it: French is a subtle, many-layered language, and it can take a lifetime to learn its complexities. The correct translation of pruneaux d'Agen is "prunes soaked in booze." The booze, by tradition, is armagnac, a brandy from the region of the same name. You could use cognac, or calvados, or even a nameless brandy if you don't have any armagnac. But if you're going to do something, you should do it right, so I recommend a decent but not stupidly expensive armagnac, such as Armagnac de Montal. The recipe, such as it is, is fairly simple. (1) Take a smallish jar, such as a jelly or mason jar. (2) Fill it full of prunes. Pack them snugly, but not so tightly that there is no air. (3) Pour your liquor over the prunes until the jar is full. Seal it. (4) Stick the jar in a cool dark place for several months. The fruit will absorb some of the alcohol over time, so peek in periodically and top off the jar. Eat them whenever you feel like it. 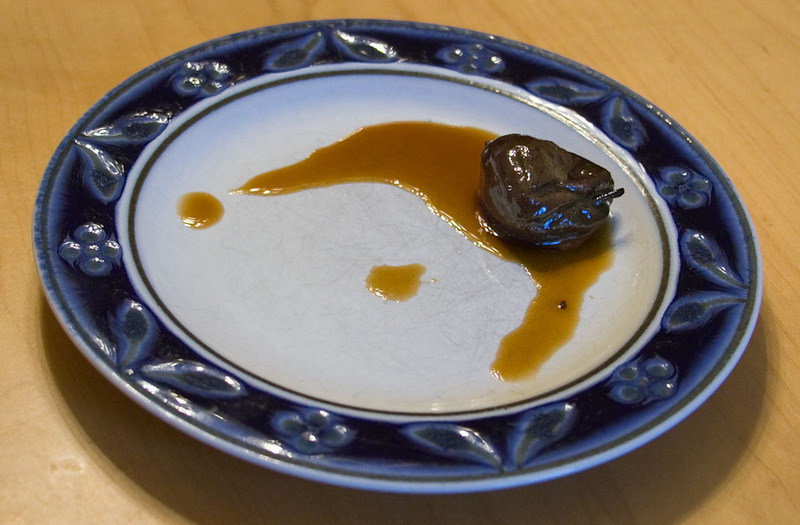 Periodically ask your friends if they like prunes, and when they say "no," go get the jar, open it up, put some on a plate, spoon some of the liqueur over them, and eat the prunes in front of them. Don't offer them any, either. Occasionally let out a cackle, for effect. If you continually reuse the same liquid for multiple batches of prunes, it will eventually turn into an alcohol-tinged syrup, rather than a fruit-tinged alcohol. While this has its own attraction, I prefer to start with a fresh infusion of armagnac every time. You can eat these straight, or you can serve them with tea, or brandy, or dessert. There are very few desserts that are not improved by putting a booze-infused prune on them. Wikipedia has an interesting article about Armagnac (the drink, not the region). The history of the Agen prune (en français). Man, I haven't had prunes since... ...Jesus, I haven't had prunes since George H. Bush was in office. You inspire me sir. Consider your crazy looking plate with a piece of brain on it covered in goo an inspiration. Can one get drunk by eating prunes? Green LA girl, I "researched" this very question ("can one get drunk by eating prunes?") last night. My methodology involved eating a number of pruneaux d'agen while writing the article. The answer? Yes. Yes, you can. Lower-proof outcome, but you can have them tonight.